Downloading films from the internet may be about to get a lot speedier, thanks to a new prototype chipset made by IBM . IBM researchers have developed a chipset that uses optics instead of electrons. According to the company, the new technology can transfer data eight times faster than the current technology. And one of the obvious benefits will be speedier downloads. A prototype of the optical chipset is being showed off later today by IBM's research team. They claim download and upload speeds will be beefed up eight-fold using the chipset. The chipset can transfer data at 160Gbit/s by sending information as optical impulses rather than electrons. The technology will be used by both businesses and consumers within three years, according to IBM. "The explosion in the amount of data being transferred, when downloading movies, TV shows, music or photos, is creating demand for greater bandwidth and higher speeds in connectivity," said Dr TC Chen, vice-president of science and technology at IBM Research. IBM said this need can be addressed by building an optical chipset based on standard CMOS (complementary metal oxide semiconductor) technology, but in combination with optical material. 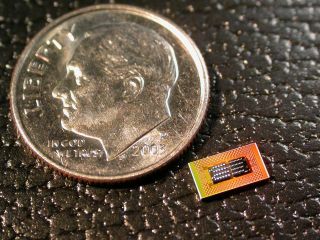 IBM's optical chip measures 3.25 x 5.25mm, which is small enough to be integrated into a chipset. However, even if the technology exists today it will probably take around three years for manufacturers to make the parts that IBM needs in order to introduce optical chipsets to its product range, the company said. "When the chipset is in mass production, it may have direct implications on applications used, from calculations to communications to entertainment," Chen said. He said downloading a high-definition movie using the new chip would take a fraction of a second, compared to the 30 minutes it typically takes over a home broadband connection.